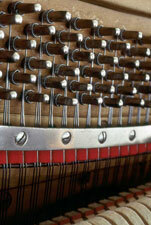 Fairbanks Piano Center offers complete piano tuning and repair services. 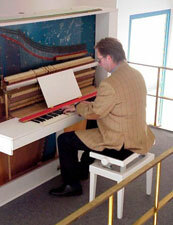 Our technician, Kit Cleworth, has been servicing and tuning pianos here in Fairbanks for 28 years. Customers include most of the area schools, churches, the UAF music department, Fairbanks Symphony Orchestra, Fairbanks Concert Association and hundreds of private piano owners. What are the benefits of tuning my piano? Tuning your piano not only makes it sound better, it also helps keep your piano in good condition so that it may be playable for many years to come. Pianos are made of organic materials (mostly wood and metal) which are extremely sensitive to and susceptible to environmental changes in humidity and temperature. These elements can cause a piano to go out of tune rapidly, and if left unserviced, can cause a piano become unplayable. The best way to combat this is to have a piano technician regularly service your piano. Another benefit is that miscellaneous small repairs such as sticking keys, squeaking pedals, etc, are usually repaired during a tuning, many time at no cost. Many potential problems can be dealt with before they become big problems. What sort of repairs do you do? We are able to make just about any kind repair that your piano may need. We offer all services including parts replacement, repair, and reconditioning. If it is a broken key, a broken string, a missing key top, a loose key, or anything else–we can fix it. Regulation is a term that is used to refer to the intricate adjustments to the action of a piano (the part between the keys and the strings that makes the piano work) to make it play and feel the way it should. There are an average of over 9,000 parts in a piano, regulating all the minute intricacies help the piano perform in the best way it can. Pianos need to be regulated in order to keep them in good working condition (just like tuning!). Over time, the wood, felt, metal, and buckskin in the piano settles and compresses. Regulation re-adjusts these parts so the piano will perform optimally. Often times a pianist will say, “my piano doesn’t feel right” or “when I push the keys I lose power” or “this piano is difficult to play quietly on”. These are all most likely regulation issues, and can be solved by having a qualified technician regulate your piano. ALL pianos need regulation at one time or another and it is regarded as an essential part of piano maintenance.